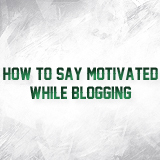 I know as much as any freelancer or blogger how difficult it can be to stay motivated while you’re blogging. It’s easy to get distracted and lose your train of thought. After daydreaming for a few minutes, it gets harder and harder to get back on track. That’s when procrastination starts to set in. You look for any excuse not to go back to work. You’re just going to spend a few minutes on Facebook, you really need to check your bank statements, or you need to write up your grocery list before you forget. Before you know it, an hour or two has passed, and you haven’t done a thing. If this sounds like you, you should know that there is hope. I used to be the worst procrastinator of them all, but I have found a few things that really help me stay on task. The following tips have definitely changed the way I work, and I hope they will help you stay motivated and help you blog better. Wake up at the same time every day, and take some time to get ready for work. Take a shower, put on some work cloths, and have a healthy breakfast. When you start each day the same, it really gets you in the right frame of mind to go to work, especially when you work from home. When you wear your pajamas to do work, you don’t have a separation from what you should do on a work day and what you can do on a lazy Sunday. Also, take a little time in the morning for yourself. Drink a cup of coffee or tea and take some quiet time to sit or watch your favorite morning show. Use that time to look forward to what you have to do that day. If you stay positive about work from the moment you wake up, it will be easier for you to look forward to the day ahead of you. This is especially important when you work from home. You shouldn’t ever work from bed or in front of the TV on your couch. You need to create a special place just for work. That way, whenever you sit down in that space, your mind associates it with work. If you work in bed, it may be difficult for you to sleep because your mind also associates the bed with work. Your work space should also be decorated to make you feel comfortable. You don’t want so many decorations that you get distracted, but you should make the space your own. Put up a quote that inspires you or a picture of your family to help you remember why you do what you do. When you have a time that you know you will be able to take a few minutes away from your computer, it will be easier for you to stay focused for “just 15 more minutes.” During your breaks, take your eyes off the screen. Don’t use it to go on a social networking site or to check your email. Step away from the screen, and use this time to do some household chores, read a book, or get a snack. When you’re done, you can go back to the computer refreshed and ready to take on your next task. I know I already said you should take some time in the morning for you, but you’ll need to do this after work as well. This is the time to forget about work, so don’t let it control your life. Taking this time for you and your family will help you avoid procrastinating because you won’t have to think about your personal life as much while you’re at work. Keep these two parts of your life as separate as possible. Then you will be motivated to stay focused on your work while you’re supposed to be working and on your family or home life after your work day is done. Hope these steps help you to blog better . I love it! I find if ?I don't take breaks my mind turns to mush. If I go for a hike, my mind starts up again with all kinds of ideas. I have to write them down though because the second I sit down in front of the computer, I forget. You always have to make time for you – it is amazing how much more you can accomplish by just doing something else for awhile – exercising, meeting a friend for dinner, watching a movie, reading a book, etc. Great post 😀 Yea I never have a problem with… well no I can't say that. I CAN say I shut down when I'm out of blogging mojo. I think I post like once a month when that happens 😛 But then I come back and I get all kinds of ideas, post for a few weeks then I'm out again. It's hard to come up with original content every day, ya know? Especially when you're not blogging about niche stuff. Happens to me too Jenny. The time when I need ideas, they do not come rather the ideas pour in at the wrong time when I am not able to blog. True that, coming up with original content is hard!